Dan Micciche has apologised for blasting MK Dons fans posting news of an injury to goalkeeper Lee Nicholls ahead of their game with Doncaster Rovers on Saturday. Nicholls looks set to miss the remainder of the season with the injury picked up against Wigan last weekend, but news of his injury broke on Tuesday night, nearly four days prior to the game with Doncaster Rovers. Speaking on Sunday however, the Dons boss, who saw his side drop to 23rd in the table on Saturday after losing 2-1 to Rovers at Stadium MK, backtracked and said the fans were the last people who should be blamed at the moment. 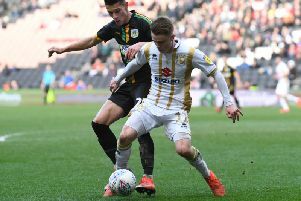 "I thought it was important I came in to apologise for a comment I made regarding the Lee Nicholls situtation after the game," Micciche told iFollow MK Dons. "Hopefully everyone can understand that it was a really frustrating result, it was an emotional day and I've made a comment regarding the supporters leaking Lee situation. "The supporters are the last people who should be blamed at this time. They've been so supportive of me since the day I got the job. "We've got the utmost confidence in Wieger. Lee is a top keeper, has had a top season and has worked hard to be the number one here. The frustration is, when it's a keeper, it's more uniqure than an outfield player. If we'd have kept it under-wraps, Doncaster wouldn't be aware until 2pm when they see our team sheets, but finding out three days before they know who we'll bring in to replace him."